Elise Meckbach is a licensed professional counselor. She started her career in Philadelphia as a foster care caseworker and then worked as a therapeutic foster care therapist. After moving to the Williamsport area in 2008, Elise has enjoyed practicing family-based mental health and providing outpatient therapy (clinic and school settings). Elise joined Family Practice Center in 2013 where she sees patients ages 7 and older. 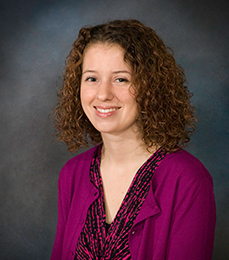 Elise specializes in meeting with adolescents (ages 7 and older) and their families. She advocates an integrative holistic approach tailored to meet the individual mental, physical, and spiritual needs of her clients. Elise believes that problems often stem from having an unmet core need and is passionate about working with people to evaluate the current techniques they are using to achieve their need and then helping them discover a more effective method. Elise teaches communication skills, positive coping skills, relaxation techniques, and approaches for reframing negative thinking into positive thinking. She provides a safe and nonjudgmental environment but also holds her clients accountable, encouraging them to make changes outside the office.